This is an edited transcript of an oral history interview with Miriam Schapiro, conducted by Ruth Bowman in East Hampton, NY. September 10, 1989. Archives of American Art, Smithsonian Institution. Miriam Schapiro, ca. 1970s. Courtesy of the Flomenhaft Gallery. In this interview, Miriam Schapiro describes her discovery of a new, more engaged way of teaching when she moved to Southern California from New York, and how that was inspired by what she witnessed visiting Judy Chicago’s class at Fresno State. This meeting led to the two artists collaborating on the Feminist Art Program at CalArts, and Schapiro discusses the program and describes some of the student projects, including Womanhouse and Anonymous Was a Woman. She then discusses her return to New York and her role in establishing the feminist art journal Heresies. MIRIAM SCHAPIRO: We went to California in 1967. RUTH BOWMAN: You went to the University of California in San Diego? MS: Yes, Paul Brach went as a chairman, the originator of the present art department, and I accompanied him and taught in his department. Those were the days where the word nepotism was used as a pejorative word in academia, and as time has gone on, it’s become less major and less serious. RB: So what was your status? MS: Well, I left New York, my family, all my friends, my network, my gallery, André Emmerich, everything that I had going for me—the beginnings of my career and so forth—to trek westward with Paul, who had a job waiting as chair of this department. And what he told UCSD was that he couldn’t possibly take this job without some promise of work and a studio for me to paint in; he said I would be happy to be part of the university even on the level of lecturer, which is the lowest level you could be. And that was true; that’s the way I felt. I really wasn’t seeking status in academia. So they said that would be fine, and they got him out there, and they told him—I remember it was the first day he was there—they told him, no, they were sorry, but there really would be no job for me. And now, meanwhile, everything had been packed and shipped. Our son was nine years old, and he was in the act of being transferred to another school. So Paul said to his boss, who was the provost, “What do you mean? What’s happened? I was promised that we would both have a place here.” And the provost said, “Well, it’s just been rescinded, and there’s not much I can do about it.” Paul, telling this story later, said he played the biggest poker bluff of his life, which was that he said to the man, “I’m sorry, if she can’t be here, I can’t be here.” And he turned on his heel, and he walked toward the door, and he put his hand on the knob, and he started to open the door and leave, when the provost yelled after him, “Just a minute, just a minute.” Paul turned around, and he said, “Yes?” And he said, “All decisions can be reversed.” And Paul said, “Will this decision be reversed?” And he said, “I think so.” And so after all of this we achieved my lectureship. RB: And you had a studio. They were separate buildings, weren’t they, from the department? MS: Yes. Well, the curious thing was, we weren’t there very long, maybe a couple of years, when Paul got this letter from Herb Blau telling him they were starting a very interesting academic institution in Los Angeles and would he come up and talk to them because they wanted him to be the first dean of the art school at CalArts. And he did that, and he moved. I didn’t move with him because Peter had one more year before high school. RB: So you stayed on as a lecturer? MS: I stayed… No. The minute Paul left, they made me a professor. RB: —and had this commuting back and forth. About 400 miles, I guess. RB: And CalArts was then in Valencia? MS: CalArts was in the old convent the first year. MS: Near MacArthur Park, yeah. And then, the next year, the year I moved up to Santa Monica, CalArts moved to its new home in Valencia. RB: And the commute was quite long. It was, what, about an hour? Up to hot old Valencia? RB: And you, what were you doing? You didn’t teach at CalArts, did you? MS: Oh, yes. You can’t imagine how many husbands and wives there were there. The deanship of dance was shared by husband and wife. A man would be in maintenance and his wife would be secretary to a dean, for example. RB: So it was a family kind of experience. RB: And what kind of subjects were you teaching? You were teaching drawing? MS: It really was at UCSD that I began to form my philosophy of teaching. I began to see how restrictive a life it was to be a teacher. I felt that it was incumbent on me to know everything in order to inform students. Well, you know what it’s like when you go to university, and your students don’t really know anything about art. I was teaching beginning classes for Paul. I would be teaching perhaps one-seventh of a class after the large lecture in the lecture hall, which contained all seven of these groups. These were enormous numbers of students that were being taught. And, remember, it ended up at Berkeley with the students’ revolution, where students cried, “We’ve become anonymous. We’re nobodies in this.” Sometimes the professor didn’t even appear, and his voice was recorded on tape, as a televised appearance. RB: So the whole University of California system needed a shake-up. And you were there right in the crisis? MS: We came right at that time. My sense of teaching was that I had a group of receptors who sat there, I was at the head of the class, and I felt—except for my insights and what I knew about art—I felt no more equipped to really be there in that position than the man in the moon. I mean, I felt that it wasn’t a logical or proper way for me to be teaching. It was at that time that I began to formulate different ways of teaching. RB: Now, there were other people that Paul brought or that you knew there like the Antins—Eleanor and David Antin? RB: Harold Cohen with him. RB: You. This was a community that you had there. RB: And in the community, did you talk together about the problems of teaching in this way? MS: No, because I’m not sure everybody felt as I did. The way I felt led to a revolutionary experiment that then took place at CalArts. RB: Where you had the freedom to do that? MS: Yes. Well, in the interim between my staying the extra year at UCSD and then leaving and going to CalArts, I met Judy Chicago. Judy came to San Diego to give a lecture, and subsequently she had me visit Fresno, where she was teaching, and give a lecture. The difference between the atmosphere that I was living in and the atmosphere that she had created was astonishing to me. I felt she was involved in an appropriate historical change. And I think that what I reacted to was really part of what was necessary for the future and was actually what the Berkeley students were up in arms about. RB: And this was about 1970? Sheila Levrant de Bretteville, Womanhouse catalogue, 1972. Courtesy of Sheila Levrant de Bretteville and the California Institute of the Arts Archive. MS: It was just about ’69, ’70. The Berkeley students were decrying the loss of personal contact, any possibility of intimacy in teaching. And what was happening with Judy and her group is that she was reinstating all of that. Subsequently, we got together. And the way that happened was that I presented to the male group who were working for Paul at CalArts the possibility that Judy and I would team-teach a women’s class. They didn’t really know Judy, and she carried a very volatile mythology around her, so they were cautious. But I persuaded them that, since I was fifteen years older than she, I would be the leavening influence, and I told them I believed that this program could develop into something very important. And so by virtue of their faith in me and my past performances in terms of my career, and what they had seen of me as a teacher and so forth, they agreed to let us do that. That was a big move. However, as far as CalArts was concerned, it wasn’t so radical because at CalArts at that time they were doing the most amazing things. Victor Papanek, who was teaching design, had his students making radios for a penny each that could be shipped to Third World people. This was a radical notion. In the music department, they had imported dancers from West Africa, and they were constantly doing a chicken dance in the halls. They flapped their arms and spoke very little English. And then, again in the halls, starting at six o’clock in the morning, students and teachers practiced their t’ai chi. Ravi Shankar was another one of these people. Gene Youngblood was a brilliant analyst of film and movies, and he was there at that time. So it was just a grand melee of radical procedures. And our Feminist Art Program simply took its place. RB: When you announced the course, what happened with the students? MS: We announced the course and the students were shy and curious, and so we sat at a table and talked about what it would be like. We also talked to the faculty. I remember the whole faculty attending a retreat at that time. And the woman who ultimately taught the design program for women only—Sheila de Bretteville—explaining what her class would be like. Judy and I talked about what we had planned. I didn’t know at that time, nor did Judy, that we would do Womanhouse. Once we met the students in our class—there were 21—we talked about doing a community project and it turned out to be Womanhouse. RB: And Womanhouse had a catalog? MS: Oh, yes. Not only a catalog. 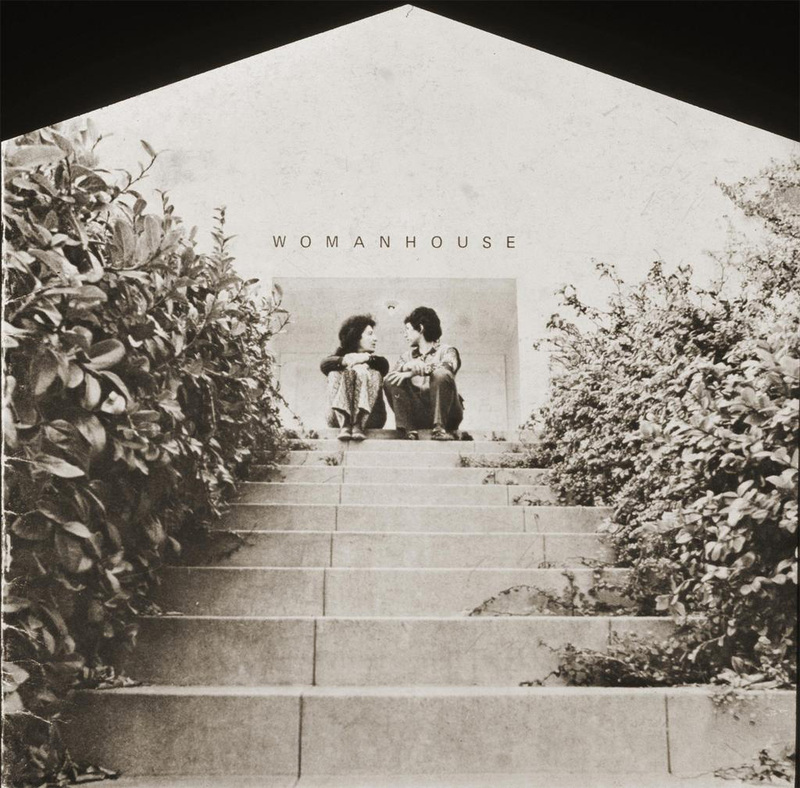 Womanhouse was a phenomenon, a cultural phenomenon, not only in California but everywhere. RB: It was nationally known. MS: But it was also internationally known. When Womanhouse was finished, we were interviewed by Encyclopedia Britannica. An hour program was done on KPFK. We were written up in Time-Life. We received incredible publicity. And when you think that the young people, students in an art class, made and experienced this event, it was really quite extraordinary. RB: Womanhouse was a building in which environments were made by each student? MS: Well, it was an artistic project. And it wasn’t linear in the sense that when you enter my home you enter a vestibule and then you go into the living room. I mean, the sequence was unpredictable. We took over a house, and the house had many rooms. Each student was interested in a particular room, and so they created a sort of happening environment in each of their rooms. One woman painted enormous leaves on the wall. This was her expression of love of beauty and regard for nature. We called it the Leaf Room. It was very beautiful. And near that was a more traditional bedroom, where several students working together created a room patterned on Gigi, a story by Colette, the French writer. The room was the bedroom of a courtesan. It was a very elegant room. The women went to an antiques dealer and talked him into loaning them incredible Victorian furniture. They made a very dense, perfumed room with lace and satin and a vanity, I remember, with all sorts of encrusted silver hairbrushes, and so forth. But the point is that they created an atmosphere, an environment, which was specific to itself and that had nothing to do with the other rooms in the house. RB: And each room was really separate—the kitchen, the bathroom? MS: Every room was separate. RB: And did they sort of draw straws for who got what room, or did it just fall into place? 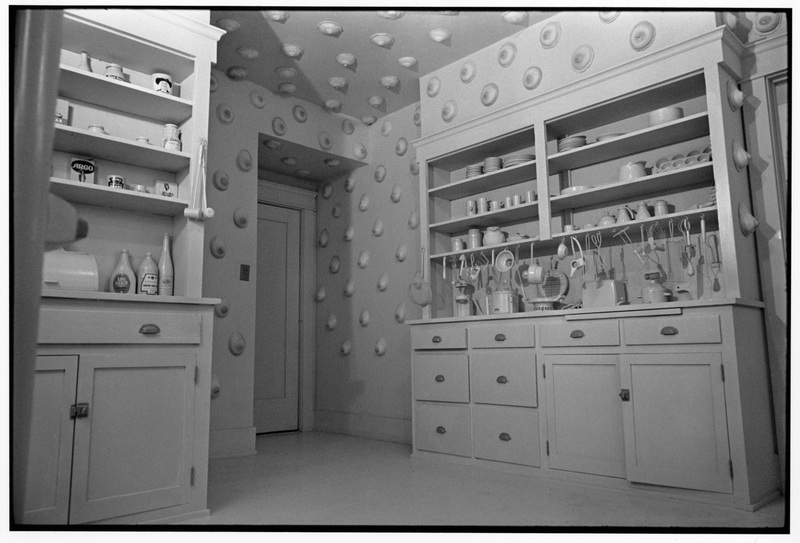 Robin Weltsch, Susan Frazier and Vicky Hodgett, Nurturant Kitchen at Womanhouse, 1972. Courtesy of the California Institute of the Arts Archive. MS: That would ultimately be a description of their relationships with their mothers. It’s really very true, isn’t it? Was she giving or taking away in her nurturance? RB: And to objectify all of that into an environment must have been quite a challenge. MS: Well, here is the part where I asked myself, “A teacher? What kind of a teacher can I be?” But ultimately I accepted myself as a facilitator. My growing philosophy of education was based on the idea that they had as much to tell me, as I had to tell them. The only difference was in our ages—that indeed if I had lived longer than they did, which I had, I had more experiences perhaps. But they might have had denser experiences. Remember, those were the days of heavy drugs. And in our separate performances at Womanhouse, one of the groups made a marvelous theatrical piece about drug users, and that certainly wasn’t my experience. RB: How did the academic deans, how did the management of the school react to all of this? What was their relationship to you? I mean, you were doing something, I’m sure, beyond what had been done before, ever. MS: Ruth, remember we worked for the Disneys, who were considered not conservative but reactionary people. MS: So your question is well put. However, the one Disney (by marriage) who was head of the school had been converted in some way. He became enormously tolerant of this whole weird environment that was CalArts. And no one in management ever said anything. When you came into Womanhouse, to see the performances or went through the rooms, you knew immediately you were in the face of something you’d never seen before in the art world. There was Judy’s “menstruation bathroom.” My room had a dollhouse in it. Everybody made something quite different, and these rooms were all inspired by a woman’s point of view. We made a film of Womanhouse. Danny Selznick, who was on our board, brought the idea of Womanhouse, to the American Film Council, and they gave Joanna Demetrakis a grant to film Womanhouse. We have that as a record. RB: So it was a parallel activity to the establishment, or what is art. It wasn’t really a challenge to what is art; it was another art form? MS: It was a reinforcement for women also. RB: Of those 21 students, how many stayed in touch with you? How many moved into the art world? MS: About half of them. Robin Mitchell, Faith Wilding, Suzanne Lacy, Mira Schor—oh, a number of them stay in touch. RB: Right, and are they still in California and still working? MS: Faith and Mira are in New York and doing very well. Faith and Mira would always do well, in my opinion, but their journey was so different from that of David Salle and Eric Fischl, who were their colleagues at CalArts, because theirs was a woman’s point of view in the art-making process and that was not something that was really acceptable then. When you walked into my house earlier, did you see that piece on the wall that was like a dress? That’s Mira’s piece. It looks like a dress, reads like a book, and has secrets. RB: In California, you were teaching at CalArts for five or six years? RB: Four years. And you—Judy Chicago came down from Northern California. She came from Fresno for about two years and left. RB: Nobody knew she was a woman, right? was a poster, a book, and a celebration of women’s creativity at CalArts. As a book, it was a gathering of letters. The women in our Feminist Art Program sent letters to a variety of established women in the art world—critics, poets, curators, artists—and they asked, “How’d you do it? We’re young. We’re students here. We want to know.” And then this beautiful collection of replies came back, and we published them. RB: Under the quotation from Virginia Woolf. RB: And was it Virginia Woolf’s life or just the quote that made you choose the title? MS: Virginia really is a heroine to creative feminists, in the sense that her life is so instructive to us. Her devotion to her art. The fact that she was so original. Also the tragedy of her life. You know, these things belong to us. Like Sylvia Plath’s life or like Frida Kahlo’s life. It’s always somehow inspiring to think of someone who had great suffering and yet great achievement at the same time. We are inspired by their redemption. These women are all heroines. Certainly it was Virginia Woolf’s life as well as her work. And also her attitudes toward society and her particular way of being a feminist. For example, she had a lot of trouble joining groups. A lot of women have trouble joining groups. But that doesn’t stop you from expressing your point of view in whatever manner you choose to do it. That’s what she did. She made her little pamphlets, and she was a journalist. She published books, and she wrote her own books. She and her husband were a partnership; they published together. And ultimately she took her life. And all of that made for a genuine kind of myth for women who were at that time being so conscious of the fact that they were women and that they had a history. We needed to have role models. Everything came together at the same time: art and consciousness, myth and reality. You asked me before, and I don’t think we went into it, why did I think that California was a particularly fertile ground for all this to happen? I don’t think it could have ever happened in New York. New York is hell-bent on separating one person from another because of the competition. And in California there was some chance for us to get together. And it was as simple as that. My life would never have been what it is today if I hadn’t had that eight years in California. My life changed there. The difference between the California women and the New York women was that the New York women were “head” women, and in California they were “body” women, which is not to say that the New York women weren’t involved with their bodies, but not in the same way. Because in California people are sun worshipers who live in a climate which emphasizes involvement with their bodies. In New York that doesn’t happen. In the intellectual community or in the artistic community, the concentration is on what is mental. 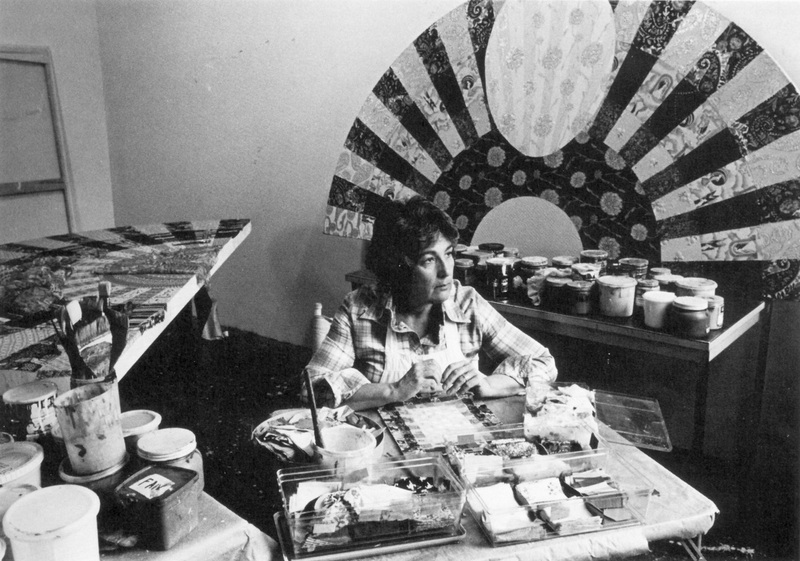 To give you an example, Judy Chicago would be a wonderful example of a “head-body” person and Lucy Lippard would be a wonderful example of a “head” person. And they were both important figures in the woman-artist movement. RB: And when in this decade did the idea of making a special publication, Heresies, come up? MS: Well, I brought that idea back from California, a continuation of the publishing ideas we had tried at CalArts. When I left New York in 1967 and had a new development in my life—in my thinking, in my art—when all this happened, some people who had been my New York friends before California couldn’t quite handle it, and I lost a lot of friends. But one friend was faithful, Joyce Kozloff. So when I came back to New York with Paul—Peter, our son, remained at San Francisco State—I said I had a few ideas that I would like to present to the women artists of New York, and Joyce called a meeting and we presented the idea of a school or the idea of a magazine, and the idea of a magazine was the one that really caught on. Although there was a school, the Feminist Art Institute, which subsequently opened. I organized it with a group of women, including Betsy Damon. I worked there only six months. 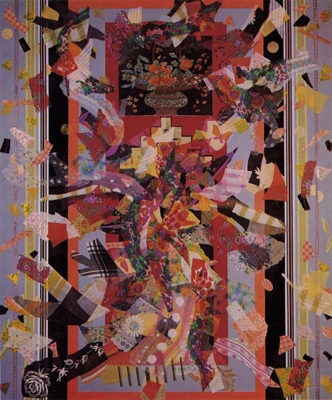 Miriam Schapiro, Personal Appearance #3, 1973. Fabric, paper, collage, and acrylic on canvas, 60 x 50 in. Courtesy of the Flomenhaft Gallery. But it was the magazine, Heresies, which caught on like wildfire and became one of the most interesting small publications in the seventies and eighties. It’s about to have its tenth anniversary. It is one of the best philosophical statements of feminist thinking. You know, the popular image of a feminist is as a bra burner, but there’s a hell of a lot more to it than that. I think what we women did was to democratize art. I think today a lot of what goes on in galleries—I’m not saying it’s successful—is a democratization of art. For example, there’s an important movement toward recognizing ethnicity. Recently, I was amused because one of my paintings wasn’t permitted to go to Russia. The man who was organizing the show said, “Well, your work is not political so therefore you don’t qualify for this show, because we’re just showing political work.” In 1972, it was the reverse. I was excluded from shows because I was political. But now there’s a new politics, and the new politics calls for new laws and new rules. So what’s political today is that you have to be a nonmainstream ethnic, an outsider, and then whatever you do is considered political. I’m not putting this trend down. I’m just trying to point out how the shifts and changes go, and how complex it is, and how it’s all in the area of gray. MS: The aprons and the needlework and ultimately our producing that fabulous issue of Heresies called Women’s Traditional Art. I’m so gung-ho about Heresies because it really is an encyclopedia of everything I’m talking about. Every issue was different, and each issue was published by a new collective. So the process of publishing was different and the content was different. Ruth Bowman is an art historian, educator and critic, specializing in 19th and 20th Century American painting, sculpture and architecture. Her contribution to the arts has spanned over 40 years, beginning in the early 1960s at the Jewish Museum. She was a curator of the New York University Art Collection, founder of the Grey Art Gallery, staff lecturer at the Museum of Modern Art, Director of Education for the Los Angeles County Museum of Art and contributed a multi-lecture course art on 20th century American art to the “Sunrise Semester,” a distance-learning program broadcast on CBS from 1957 to 1982. In 2002, The National Portrait Gallery acquired the Ruth Bowman and Harry Kahn 20th Century American Self-Portrait Collection. Ruth’s many interviews with artists and art historians are housed at the Smithsonian’s Archives of American Art.